Like flies attracted to feces, The Obamalith is attracted to and just loves the Commies, doesn't he? We have another Commie tied to Obama. ...the University of Chicago. My, my, my how interesting. That's the same place Obama's good buddy Domestic Terrorist William Ayers teaches! It's a small world after all, it's a small, small world - ain't it? Mike's father Robert, according to the Wiki page, was also a Commie. Ah, like father like son. Klonsky also had previously penned many postings to the official Obama Campaign site, but - gosh darn it - those posts are now gone! They've been scrubbed! Removed! Spiked! The official campaign website of Sen. Barack Obama has completely scrubbed a series of user-generated blog postings on the candidate's site by a former top communist activist who is an associate of former Weathermen terrorist leader William Ayers. Klonsky served with Ayers and Ayer's wife, former Weathermen terrorist Bernadine Dohrn, in the Students for a Democratic Society group, a major leftist student organization in the 1960s that later splintered, with Ayers and Dohrn leading a more activist approach with the Weathermen. It's amazing how many things get scrubbed from Obama's Site. His "Iraq surge policy will fail" statements have all been scrubbed from his site. Now Obama is busy scrubbing his site from blog postings from his friend Klonsky The Commie. We'll overlook all these things that Obama has done and the people he associates with, because he's a Liberal! 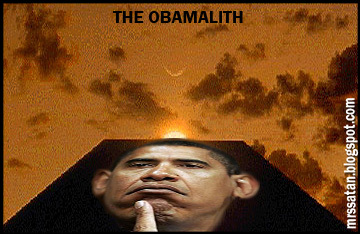 The Obamalith. It knows all. Question it not. Do what it tells you to do! Oh...good Christ. If Sarah Palin or McCain had a William Ayers or a Mike Klonsky in their background, they could kiss their political aspirations good bye. But Obama? Oh, the MSM won't breath a word of it. Fuckers. I hate the MSM.